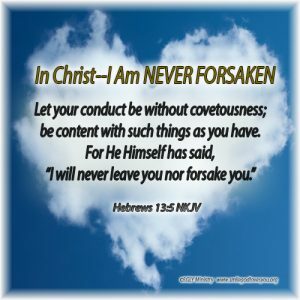 Believers, here are 4 more specific verses that say the Lord will never leave us nor forsake us. Deuteronomy 31:8 – And the LORD, he [it is] that doth go before thee; he will be with thee, he will not fail thee, neither forsake thee: fear not, neither be dismayed. 1 Chronicles 28:20 – And David said to Solomon his son, Be strong and of good courage, and do [it]: fear not, nor be dismayed: for the LORD God, [even] my God, [will be] with thee; he will not fail thee, nor forsake thee, until thou hast finished all the work for the service of the house of the LORD. Matthew 28:20 – Teaching them to observe all things whatsoever I have commanded you: and, lo, I am with you alway, [even] unto the end of the world. Amen. Need we ever wonder or doubt? The Lord’s word is true. He is always with us. Fear not!